Ever wondered what to do with radishes? How about roasting them! This simple technique is the perfect spring side dish, all you need is four ingredients; radishes, olive oil, salt and pepper. 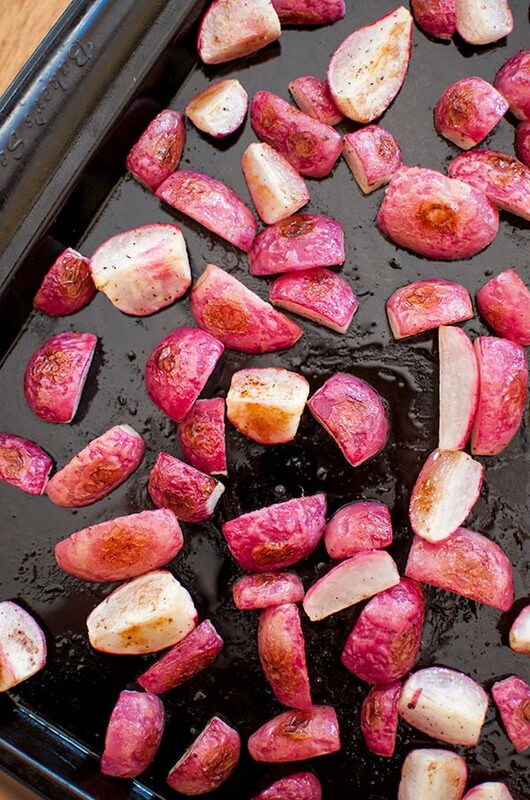 Here’s how to roast radishes. Well, it certainly doesn’t feel like spring in Toronto. There is snow on the ground. It’s freezing. My walk from the subway on Saturday night made me want to cry (mostly because I didn’t realize it was freezing and I wasn’t wearing my heavy-duty parka). But look, if there is one thing you can count on right now it’s that spring is coming. Eventually. So, naturally, I think we should roast some radishes. Did you know that radishes are actually at their peak in the spring? I feel like they are such an underrated vegetable, everyone is always excited for fresh spring produce (namely, asparagus) but radishes should not be ignored. Are you familiar with radishes? They have a crisp texture with peppery and slightly spicy flavour notes. 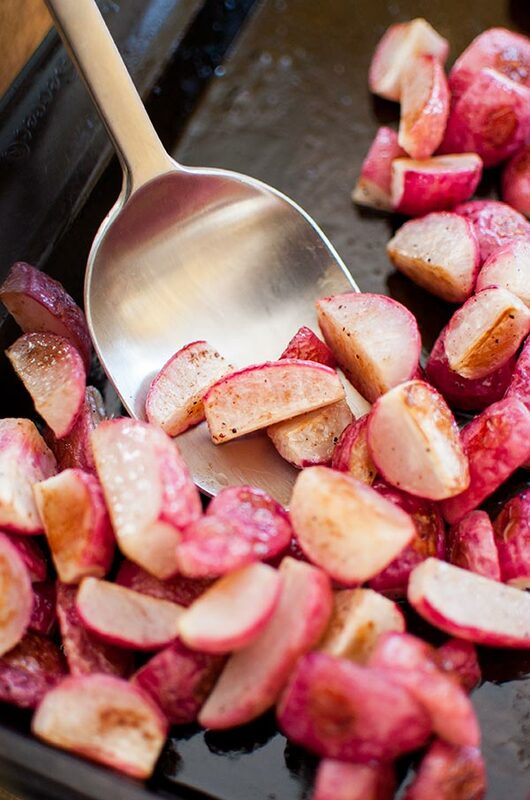 Most often you’ll use radishes raw in salads, but they can also be pickled and of course, roasted. Roasting has quickly become my favourite way to use them because it brings out a sweetness and I love when the flesh caramelizes. Talk about flavour! What are you looking forward to most about spring? Other than seasonal produce, I’m looking forward to figuring out some sort of routine for my life. I know, I know what does that statement even mean, haha! 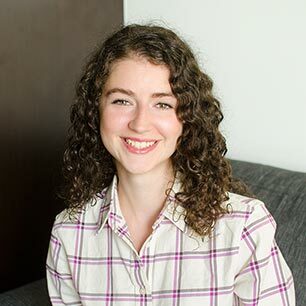 I always find that I feel rejuvenated in the spring, ready to tackle big projects and get back on track, but there are so many things I want to do that it can almost be too much. I have two modes, it’s either endless energy of the go-go-go variety, or I am completely drained and get nothing done. Right now I’m kind of in an in-between phase where I have days that I feel like I could get a million things done but I also have days where all I want to do is lie on the couch scrolling through Instagram. Anyways, now that I’m feeling more settled at my job, I’m looking forward to figuring out a new ‘normal’ routine that works for me. I’ll report back once I figure it out, I think it will take a bit of trial and error. Back to the recipe, I’m sure you know this by now, but I’m all about simple food. Food that is loaded with flavour, but easy enough to prepare. It may seem kind of silly to post a recipe for how to roast radishes, but I genuinely believe that radishes should be celebrated more. The secret to this technique is a high temperature, a good quality extra-virgin olive oil and plenty of kosher salt and pepper. That’s it. If you feel like it, you can always jazz these up by sprinkling some fresh chives to finish it off, but in all honesty, these roasted radishes are pretty perfect the way they are. Toss radishes with olive oil and salt and arrange on a baking sheet. Now that you know how to roast radishes, let me know if you give this method a try in the comments below. Thanks Janet, I'm so glad that you found this recipe useful!